Ultimate Werewolf is an interactive game of deduction for two teams: Villagers and Werewolves. The Villagers don`t know who the Werewolves are, and the Werewolves are trying to remain undiscovered while they slowly eliminate the Villagers one at a time. A Moderator (who isn`t on a team) runs the game. 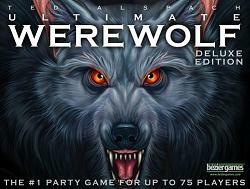 Ultimate Werewolf: Deluxe Edition features all new artwork, a great new design, totally rewritten and more comprehensive rules, and an even better moderator scorepad. What`s more, it supports more players than ever: 75 of your closest friends can converge on one or more villages using the components in this box.